The access to credit (especially formal) and the incidence of indebtedness among rural households has been a matter of intense policy debate in India. A scientific and empirical understanding of changing rural credit markets and their implications on farmers’ economic welfare is critical to harness the potential of rural credit delivery mechanisms. The understanding of such issues at decentralized level based on micro-level evidence will also be useful in reorienting the credit policies and programmes for a better impact. 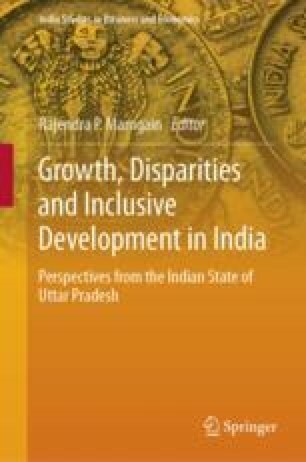 In this context, the present study was undertaken to (i) analyse the changes in the structure of rural credit delivery in Uttar Pradesh (UP), (ii) identify the factors that influence the choice of credit sources in UP and (iii) assess the impact of access to credit on farmers’ welfare. The study is based on the unit level data of Debt and Investment Survey carried out by National Sample Survey Organisation (NSSO) during 1992 (48th round), 2003 (59th round) and 2013 (70th round) and the farmers’ situation assessment survey carried out in 2013 (70th round). The structure of credit system has been assessed in terms of access of rural households to different credit outlets, share of formal credit institutions, availability of credit and interest rate. The determinants of rural households’ choice for credit sources in UP were analysed by using Heckman selection model, and the impact of farmers’ access to formal credit was examined by using instrumental variable model. The structure of credit market has changed overtime, and the share of institutional credit has increased. The initiatives taken by the government have paid off, and the flow of institutional credit to rural areas has increased significantly even in real terms. The indicators of financial inclusion have shown a sign of improvement. However, the presence of informal agencies in the disbursement of rural credit in UP is still intact. Rural households’ access to institutional credit is influenced by a number of socio-economic, institutional and policy factors. In our analysis, the education, caste affiliation, gender and assets ownership have been found to influence the rural households’ access to institutional credit significantly. Conditioned on participation, the access to formal agricultural credit has a significant positive impact on farming households’ economic welfare. A concerted effort and appropriate policy reform are required to make rural households’ access to institutional credit neutral to caste, class and regions to realize the potential impact of agricultural credit on farmers’ economic welfare. Some sections of this chapter draw from the authors’ previous works which was earlier published in 2017 as “Institutional versus non-institutional credit to agricultural households in India: Evidence on impact from a national farmers’ survey”, co-authored by Anjani Kumar, Ashok K. Mishra, Sunil Saroj and P. K. Joshi, in Vol. 41, issue 3, pp. 420–432 of Elsevier journal Economic Systems. The original study can be accessed at https://doi.org/10.1016/j.ecosys.2016.10.005.